TedxTeen - In 2016, an insightful group of teenagers from all over the world gathered in London for this Ted Talk inspired independent event. A fourteen year old from Chicago developed an Anti-Bullying computer product called Re-Think in 2014. Click HERE for her TEDxTalk. Crash Course from the PBS Learning Media has videos ranging from balancing chemical reactions to analyzing famous literature. Since 2011, brothers John and Hank Green have pioneered digital education with their series Crash Course on YouTube. From Science to Social Studies, Crash Course offers it all in quick-paced, imaginative videos aimed at learners of all ages. New resources and courses are added regularly. Disclaimer: Content of this video should be viewed as there maybe a comments or objects in the video that will catch the attention of the class and might cause some reactions. Next Vista for Learning provides a library of free videos made by and for teachers and students everywhere. All content is licensed under Creative Commons Attribution. There are over 1800 videos on the website. They also have a large collection of career videos to help middle and high school students better understand and connect to their future possibilities. Math in the pharmacy is one example of algebra in the real world. NBC Learn houses free resources that include great stories, historic news reports, original video content, and current events coverage to engage, inspire and educate K-12 and Higher Ed students. Extensive content includes Science of the Olympic games, Innovation, Earth Sciences, Writers Speak to Kids, Make it Memorable (Historic News), Science and Math of Hockey, PI is Universal, Finishing the Dream (Civil Rights). NEOK12 - This site offers education videos and games for all subjects such as life science, physical science, earth/space, math, ELA, history, geography, social studies, economics, and human body. YouTube videos are embedded on the website so filter blocking should not be an issue in schools. ClassHook -This video website searches popular collections such as TV and movies to find relevant clips to match subject specific topics. Users must sign in to get more than 5 result items in a search. Videos can be shared via email or embedded code. Users can also create playlists within the platform. The Kid Should See This - One of the most unique video curation websites out there. There’s just so much science, nature, music, art, technology, storytelling and assorted good stuff out there that my kids (and maybe your kids) haven’t seen. It’s most likely not stuff that was made for them…But we don’t underestimate kids around here. Search & enjoy 2,900+ smart & super-cool, “not-made-for-kids, but perfect for them” videos in the classroom or together at home, curated by Rion Nakaya with her 6 & 9 year olds. Click play and start a conversation. They have a "favorite list" and a "kids favorite list" that shows an interesting difference between choices some weeks. Educators can also sign up to receive an email with "5 smart videos" each week. WatchKnowLearn is a video platform that has educational videos curated not only by the website developers, but users can also upload videos. Categories range from standard subjects such as ELA, math to fine art, PE, crafts, foreign language, life skills, etc. They have a great selection of Careers and Community Jobs for early elementary classes such as Fireman, Police, and Postal worker. Educators can create accounts and save videos to a playlist so they are ready when needed in the classroom. Crash Course Kids! is a channel created by PBS Learning Media for elementary students with 105 science videos ranging from 4 minutes to 20 minutes in length. The topics covered match standards for 4th-5th grade, but are great for all elementary students and even a review for 6th grade science concepts. SciShow Kids is a YouTube Channel that explores all those curious topics that make people ask "why?" Every Monday and Wednesday, Jessi and her robot rat, Squeaks, answer questions and explain fun, complex science concepts for young, curious minds. Whether conducting experiments, researching new questions, or talking with experts, there's always something new to discover with SciShow Kids, no matter what age the students are! It's Okay To Be Smart - PBS Digital Content series showcases a combination of science and art. This series can also be found on a YouTube channel by clicking HERE . Physics Girl is a large collection of physics experiments on video explained by Dianna Cowern and published as PBS Digital Content. Content includes space, everyday physics, and interviews. There are also experiments that can be completed in class. School Tube is a video platform for students and teachers to upload video creations. School Tube offers suggested educational websites that houses content for classrooms.This platform provides opportunities for students to share video work with an "authentic audience" in a controlled privacy environment. Many schools share daily news broadcasts and PSA videos. Safe Share TV is a platform to watch YouTube without any additional videos or advertisements appearing on the screen. By copying and pasting the YouTube link into the box on the home page, the website will generate a new LINK to the video. This link will never expire and now will direct to a video display that removes all the unwanted items. Educators can now place this link in a PowerPoint or an assignment in GAFE (Google Apps For Education) that the students can select and they will not be shown "other" items. Viewpure is a platform that allows educators to share a video link to a YouTube video without the added comments or ads. Another feature of this platform is that is allows for you to select the piece of the video that should be viewed. After pasting the URL in the box and then "purifying" by selecting the button you will be able to click the GEAR and choose the start and end of the video. Users can also add a password to the video. Animoto is a platform to design video slide shows with powerful features including music and built-in video styles. Many of the layout and creation tools are taken care of by the program so it is only necessary to drag and drop of the photos. The tool includes an option for education that removes the watermark and increases the time allotment from the free version. After an educator registers for the free account, they need to "apply" for the upgraded educational version that unlocks more options. Animkaer Class allows educators to create a class for students to create animations. The free platform allows up to 25 students per account with 2 teachers. This includes privacy settings and 200 mb of space. Students can be groups (3 per account) and educators can assign 5 tasks per month. Video length is limited to 2 minutes and can only export 5 videos per month. The tool is simple to use and has a resource of copyright free resources to include in the animations. PowToon -allows users to create animated videos and presentations. The platform uses a drag and drop interface, that is simple and easy to use. This platform enables voice scripted recording with the characters on the screen. The free account allows for 5 minute videos with the PowToon watermark in the corner. The educational accounts currently start at $4.99/mo and allow for 15 minutes and more options. Premium accounts allow for student account management. Tabletop Audio has a wide variety of 10 minute ambiances and music for game and story creations. Looking for a car chase, spooky sounds, fantasy or any number of genres they can be found here. Free to download and use based on the website having everything with a creative commons license. No account is needed to download music or sounds. SpeakPipe - is a platform containing many options that allow for auditory feedback from website visitors. 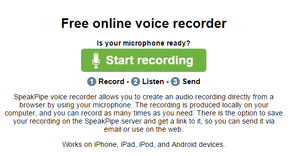 By scrolling down the main page, users will find a link to a FREE online voice recorder, (see below). Not only will it record from the computer, it can be accessed from an iPhone, iPad, and Android devices. The recordings can be saved online with a link or to the device/computer. BBC Sound Effects hosts over 16,000 sound effects that are made available under the RemArc License. (England’s CC) Website is simple to navigate, preview and download resources. There are categories to assist in searching and you can try keywords as well. Each resource shown in a search or just scrolling does have an accurate description to help you decide if it is right for the project. Remember it is from England so if you want movie sounds search for CINE. FreePlay music has over 50,000 songs that can be used for free within educational settings. (Uploading the YouTube requires a different license, however still free.) Users can search by category, genre, and mood. Using the music for any revenue generating production or off—campus use requires a business license. Currently that is $25/year for educators. CC Mixter (Creative Commons Mixter) is a music website for downloadable music for all background music needs. Musicians upload to this website with complete creative commons share-a-like license release. Instrumental and vocal music is searchable and can be previewed prior to download. Lower grade levels may need more guidance or teachers can download selections for students to work with since previewing lyrics should be done prior to some ages listening independently. SoundGator has sound effects in many categories. Users do need an account to download the files. (There are a few advertising “buttons” on the pages, so caution when clicking.) Some categories include sports, money, nature, phone, multimedia, animal, bell, beep, fire, household and musical. Vocaroo - is an audio recording website that allows for simple recording. Once recorded the platform will return a web address link to play the audio back. This address can be emailed, copied to a website or created into a QR code for playback. Users also have the choice to select "Save As" and save the recording on their computer instead of online. Chirbit is an online and app platform for recording audio files. Users can record from any computer (ChromeBook included) or mobile device. (Android and iOS!) Embed the audio on websites, listen on a mobile device, or even extract the audio from a YouTube video. upload and download sounds to and from the database, under the same creative commons license. Students can have accounts and search results will note if the sounds or songs have "explicit" content, so caution is advised. Educators can of course create an account and download an entire library of sounds to host on a thumb drive or Google drive for students to select from without the need to go online themselves. Easy platform to preview the sound prior to download and simple download. Moovly is a completely web based video editor with an abundance of templates to design from. Straight editing is also available in the studio. The platform works on Chromebooks as well as all desktop/laptops. In December 2018 they created an educational section that provides all resources for free. The downloaded or exported files do have a watermark with the free platform. When users signup for an account with an educational email address (if the educational address is a gmail or other than .edu, users will need to email or "chat" contact the company to request being identified as an educational domain.) If your domain is recognized user will automatically get a pop-up that tells them they have received the free educational account. Students should have their own account. Adobe Spark is a resource for creating videos, website pages and audio. It is unique because users can start in the online platform, then continue on an iPad, then switch to using a Chromebook, etc. Adobe also hosts or stores all the files for easy access from any location, so students can work from home. (Users may use a portable storage device). To further explain the educational uses, Adobe has created a guide for educators that can be found here: Educators Guide. It also includes many lesson ideas. Buncee enables users to easily bring together all kinds of content (Buncee artwork, photos, videos, drawings, audio, and links) onto one digital canvas, creating a cloud-based, shareable creation. Students can use Buncee to turn their experiences and lessons into multimedia digital stories, travel scrapbooks, research projects, and more. Teachers can also create interactive lessons and multimedia presentations, flip their classrooms, and send home newsletters. Microsoft Office - SWAY is a free platform that allows for uploads of photos, templates, PowerPoint slides and then creates a presentation that can automatically adjust to any platform. As an example, a presentation can be viewed on a laptop and then adjusted for viewing on a mobile device (tablet or phone). There are great tutorials to learn the resource, but it does take some getting used to, it is not recommended for the early elementary student. Sways can be saved online in the free Office account or exported. MySimpleShow is a super easy platform to create a video using your own script (with guidance from preset outlines.) or upload a PowerPoint (20 slides max). Education story lines that can be followed are Biographies, Historical Events, Mathematical Process, Design Inventions and Countries to name a few. The free platform supplies the "voice over" that matches what is written in the script. The free version also supplies all of the graphics. Screencast-o-Matic - Users can record on-screen activity for short tutorials, visual presentations, and communicate during demonstrations. The platform has a free version that allows a 15 minute video recording that can be published to YouTube or saved as a video file. A pro version has many more features and is currently $15/year.